How often you feed your cold-water fish and the amount you feed depend on the size of the fish and how cold the water actually is. In warmer water, or in extremely cold water, cold-water fish tend to eat less. 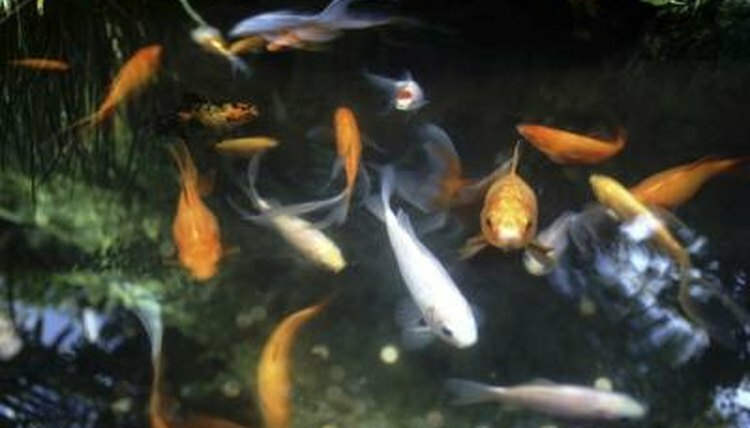 In such circumstances, you'll need to feed the fish less to keep the pond from getting polluted with decaying food. When water temperature rises to 86 degrees Fahrenheit, cold-water fish tend to lose their appetites. Minimize their feedings to ensure they actually eat their food rather than allow it to rot in the water. At 86 degrees, the fish should eat only twice daily, and less than normal at each feeding -- unless the fish are babies, as baby fish can tolerate higher temperatures easier than adults. Baby fish should eat small amounts frequently. When water temperatures are between 68 and 86 degrees Fahrenheit, cold-water fish are typically at their most active, so they require more food than they would consume at warmer or colder temperatures. When water temperatures are in this range, it's fine to feed the fish as much as they will consume multiple times each day. They can be fed small amounts around four to five times a day, or fed larger amounts three times a day. In water between 59 and 68 degrees Fahrenheit, the activities of cold-water fish usually slow down a bit. So do their digestive capacities. Feed the fish one to two times each day, in the amount that the fish are capable of eating within a few minutes. If the fish don't rise to the surface to get the food, they are satisfied with what they already had and are not hungry. Cold-water fish metabolism starts to slow down at temperatures of 59 degrees Fahrenheit or lower, so feed no more than twice a day, and only if the fish are acting hungry. The fish will demonstrate hunger by hanging around the surface, waiting for food to fall into the water. If they are staying in deeper water even in the day time, they aren't hungry. Adjust feeding times and rations accordingly. Feed fish in waters with temperatures between 41 and 50 degrees Fahrenheit about twice a week unless they display hunger. If the fish are active, they will eat more than fish who have entered partial hibernation. If the fish are already quiet and not eating much, it is fine to simply stop feeding them altogether until spring. This will not hurt the fish; they naturally eat less when the water gets too cold. When water temperature reach 41 degrees Fahrenheit or lower, even cold-water fish won't eat much anyway. When water gets to these temperatures, cold-water fish go into a partial hibernation mode until spring. When the water freezes over and the fish aren't hibernating, they will occasionally nibble on algae to provide for themselves. The fish won't need more than that.